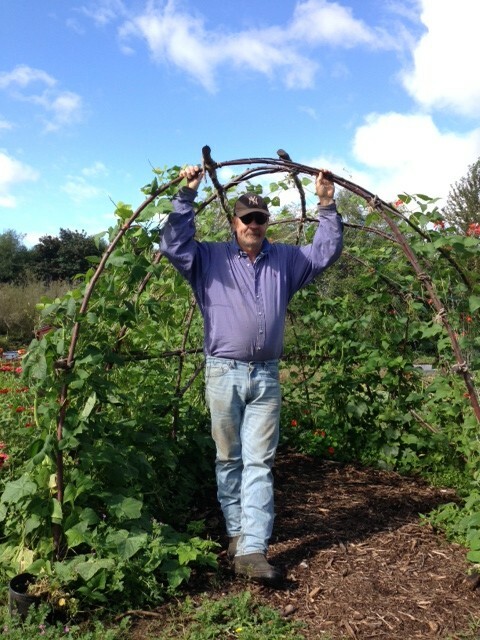 Brian MacWhorter of Butler Green Farms has been growing biodynamic vegetables and fruits in the Northwest for 40 years and on Bainbridge Island for 30 of those years. 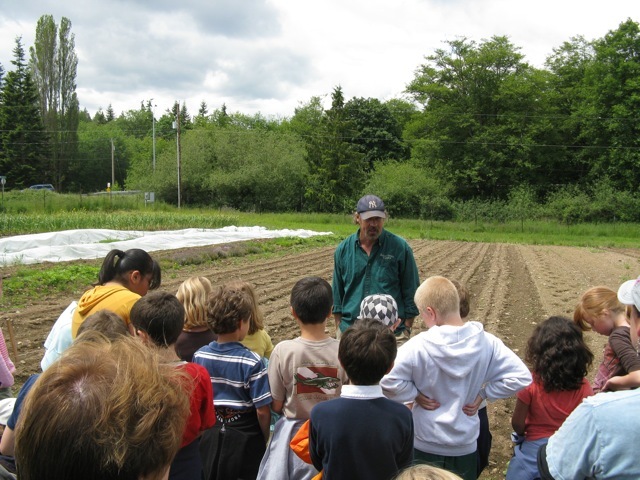 EduCulture is fortunate to have Brian & Butler Green Farms as a farm partner in delivering our edible education programs on Bainbridge Island. EduCulture founder and managing director Jon Garfunkel recently sat down with Brian to talk about the origin of Brian’s interest in sustainable farming, his history in the business, and his philosophy and hopes for the future. Brian MacWhorter at Morales Farm on Bainbridge Island. You are fortunate if you get to know farmers like Brian MacWhorter. He carries many of the iconic characteristics of a self-made, independent farmer, who has experienced decades of the challenges and successes that accompany small scale sustainable agriculture in the Pacific Northwest. Born in Dublin, Ireland and raised in Pennsylvania, Brian learned to appreciate the natural and cultivated world as a young man. He moved to the Northwest 40 years ago to apprentice with farmers in Oregon, and eventually made his way to farm on Bainbridge Island in the mid-1980’s. Brian was part of the cadre of local farmers that created a market for organic produce on Bainbridge Island, and he has been a leader in building a locally grown food chain ever since. One of his hallmark contributions to farming in this maritime climate has been the art of extending the growing season through greenhouse and hoophouse production. Butler Green Farms raises food on close to 20 acres of leased land, both public and private, on Bainbridge Island. Brian grows a variety of Northwest crops, raises animals for food products, and also does most of his own processing. Food from Butler Green Farms can be found through his own CSA (Community Supported Agriculture), Suyematsu & Bentryn Family Farm Stand, Bainbridge Farmer’s Market, and local restaurants from Harbour Public House to the Pink Door in Seattle. You will also see Brian’s profile in the produce section of Town & Country and Central Markets that have long featured his mixed greens. This local grocery store chain has also contracted with Brian to raise food for their Middlefield Farms label. Brian serves on the board of local organizations like Friends of the Farms, Bainbridge Farmer’s Market, and the Suyematsu & Bentryn Family Farmers Guild. 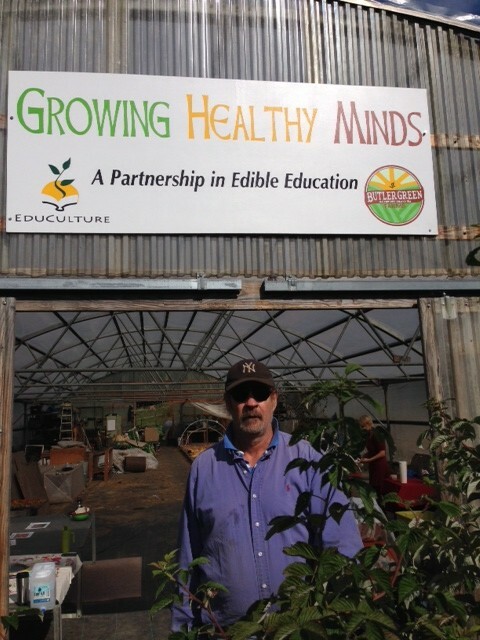 Brian is an educator at heart, and carries a strong set of values around “Growing Healthy Minds”, his motto for the edible education partnership with EduCulture. In 2010, Bulter Green Farms partnered with EduCulture at Morales Farm, on public farmland he leases to start an instructional farm, which has become a center of edible education for local schools. Farmer Brian, as he is affectionately known to all of the young people, has become a role model and face of farming in our community, through helping to normalize a taste of where we live and instill in future generations the importance of having access to food that is fresh, nutritious, clean, fair and local. The poet Gary Snyder wrote: “Find your place on the planet. Dig in, and take responsibility from there.” Brian MacWhorter has been a model of that call to stewardship. It was instilled in him by farming mentors like Akio Suyematsu. Today, Brian instills that same sense of stewardship in the many interns and junior farmers he has trained over the years, as well as with the hundreds of pre-school, elementary and secondary students who pass through his farms each year. JG: How long have you been farming, and where? BM: I was born in 1951 and grew up on a farm in Pennsylvania, so I was basically farming from the time I was 4 or 5 years old when I went out there and weeded the garden. I’ve been farming professionally for the last 40 years, starting in Eugene, Oregon. This is my 30th year farming on Bainbridge Island. JG: Why did you become a farmer and what is it that keeps your farming? BM: That’s one of those things you reexamine all the time, it’s out of the ordinary, why you would go against everything that makes sense financially. I’m a free spirit, so I follow my passion – from an early age, I just really enjoyed being out with plants, and I remember working in greenhouses when I was 8, 9 years old – it always fascinated me. I had a draw toward marine biology and almost did that, but I decided to work with plants. You don’t have to invest a lot of money in farming – I started small and my overhead was small in Eugene – and I just enjoyed it more and more. Forty years later, I’ve made some connections, I’ve been able to afford to raise a family and follow my passion. I don’t know anyone else who’s done it, especially a male. JG: How would you describe your method and approach to farming? BM: If you don’t inherit a family farm, you’re basically a steward of the land – your level of connection with the farm is this different thing. It’s not just keeping the family heritage going – you look at it more like a business. I’ve been able to jump around and take care of farms and follow different opportunities. JG: You have become known in this part of the Northwest as a farmer who is skilled at extending the growing season by using greenhouses and hothouses. How did you come to see that approach as the way you wanted to farm and what are the benefits for you? BM: I have a fascination with greenhouses because its all about control of the environment and how in the winter you can step into a space, have plants in there, and enjoy their oxygen. I’ve done green housing for 35 years and the extended season has its advantages financially, getting to the market first, but to me its just been mind boggling to make a livelihood working around plants. If you can double your growing season, and spend that around plants, it’s pretty amazing. I’ve done different designs – I’ve lived in a greenhouse – that’s the neat thing about farming, every year you can come up with some new idea. Already the environment here in the northwest, particularly Bainbridge Island, is probably the most controlled environment area in the world – the most moderate – then you throw some plastic up, and you can extend the season further. I like the idea of going to the farmers’ market, the CSA – and in March or April they’re eating carrots, beets, tomatoes in May, and they say, “What? You can’t do this!” And I get to enjoy that food all year round too. JG: Can you give us a sense of the variety of the crops you’re raising, the animals you’re raising, and the food you’re producing? BM: I grow for a market type of garden which is the most inefficient because I have to grow a variety, I want to stock basically like a store and I want to have different varieties all year round, so its challenging. This year I had carrots in March through November, I’ll have tomatoes from May to October, I have greens all year round. So it helps me in all of my business – my restaurant business – which I do with different chefs, has expanded because I’m able to provide them a product of quality and quantity for a long period of time. I worked as a chef and I understand how it allows them to work with local farmers. Most of our restaurant people deal with Charlie’s or Sysco and they can order, it just comes, and it doesn’t matter, the quality, it’s no fuss for them. But a local farmer can jump in there and provide a product that is available all the time that they can count on. The idea of being able to extend your season, have a lot of different varieties, and then throw in some animal protein…I’m doing a store, so if I have some eggs, some ground beef, some bacon, it gets people to shop there. What I aspire to do is to be able to have families that can walk to my farm and when they make their grocery list that week –when they’re going shopping – they’re thinking about me, they can come to my farm and get it first. That’s what I can do – that’s how I will be successful – that’s how other local farms will be successful – provide something that’s affordable, good quality, available for a long period of time and good selection. JG: Where in the food community besides restaurants will we find Butler Green Farms? BM: Anywhere where food is available. That’s what you hope. Marketing is the key with any business – you provide a product but you have to have a market. If anything I’ve turned into a marketing sales person more than I have a grower and I can leave growing up to some other people. You want to get as engaged as you can. Restaurants – where people eat – that’s always a good one – because if they’re talking about your product, putting your name on the menu – its always good. Especially on Bainbridge Island, people can afford to eat out more and pay more, than most restaurants would charge in this country. JG: Can you give us some examples of the restaurants? BM: Marche, the Harbor Public House, the Bistro at the Bainbridge Art Museum, Hitchcock, and Bella Luna. BM: Yes, the Pink Door. One of my satisfactions as a farmer, when you get past the struggle and are enjoying the accolades, is working with a restaurant like the Pink Door. They talk about it, its on their website, featured on their menu. Just having that relationship. Young farmers – and I’ve turned out a lot of interns over the last 10 years – ask, how do we make these connections? Well, its business – you seek out until you find some people you can really relate to, you form a relationship, and that’s what I’ve done, with a few restaurant people. But I really go out of my way to cater to them. I understand the importance. I also have a 200 family CSA – this is my 14th year, and I sell to stores. And then I have a relationship with Town & Country – I manage their family farm. JG: Tell us what its like to be a farmer in 2014 compared to when you first started? BM: I didn’t really understand so much when I first got into farming. I was lucky I was in Eugene, which was kind of the mecca of the hippy health food store – at that time in 1974, there was no organic. You know, Rodelle out of Pennsylvania had an organic gardening and farming magazine. And I just happened to be there, I was one of the first organic farms. There was some outlet with health food stores in Eugene with a little cooler, they started putting in some lettuce and that expanded. I remember taking my stuff and just giving it away. A truckload of produce, I remember getting about $100. One of the neatest, real things was just going through town, parking, and chefs would come out of the restaurant, see what I had, and buy things out of the truck. Which was the basis of what farming, the relationship was – but there was no money – they expected to pay the prices they paid for other produce. Some of my best tomatoes I grew back then in hoop houses – I’d get $4 a box, now I get about $100 – 150 a box, if you look at the difference now and then, the money that can be made. There is a cost of living exchange for sure, but in the last 40 years I’ve been farming, organic sales have gone up about 20% every year, to now being a multi-billion dollar business. So it went from zero to multi billion. There is going to be a share of that going to young farmers. Big farmers are transitioning into organics and the Monsanto’s and other companies that want to control the food industry, that do control it, are trying to do whatever they can do to change the health food movement. The health food movement has also come about because of cancer rates and different health problems we’ve had because of all these chemicals that have been used. We’ve had high production because of all these chemicals but they pretty much poisoned all the land, the environment’s been screwed up, so we’re dealing with that. A lot of the organic movement is just a result of all the toxicity in the environment. What I did not know when I moved into the Willamette Valley in the 70’s, which is such a lush area outside Eugene, is that it is an area that was made up of old family farms, and they were all going extinct. When I got there, there were all these for sale signs, there were orchards and grounds that weren’t being taken care of, it was the collapse of the family farm. Ninety percent of family farms went under. It wasn’t until the movement that I was involved in, starting the farmers market in Eugene, helping set up Oregon Tilth – one of the biggest food farm coops; helping Organically Grown get started, and now last year they moved over 50 million dollars’ worth of organic produce on the west coast. It just happened all of the sudden, it was a movement that just took off. And now there is a resurgence of family farms. All that land down in Willamette Valley that was all cannery, and corporate chemical farming, is now being bought by family farms and because of all the success of all the farmers markets on the west coast they’re doing really well. It’s been good to see. JG: As you look ahead to the next 50 years, what do you see as the challenges and opportunities for small-scale agriculture? BM: Well, Akio (Suyematsu) was 30 years older than me, so maybe I’ll farm for another 25, 30 years, I don’t know. That’s complex. You’re dealing with some real biological problems. You’re dealing with contaminated oceans, you’re dealing with contaminated environment, overpopulation on the earth, too many people, not enough food. It really depends on where you’re at. I go over and over in my head the state of the world. When I was a kid, 1962, it was Bay of Pigs, we almost had a nuclear holocaust, it was really close, we didn’t know how close it was. I think about how bad things are right now, but things haven’t really changed. There have always been problems. One good thing is we’re starting to learn local is most important. If things did happen, if you have a source of clean air, food, clean water, you’re probably better off…hard to see where things are going to go. I keep looking at family farms going up, always worried about corporations taking over, the little guy and the big guy. I don’t know – just live your life. I’m starting this farm in Mexico, and I know some people who have moved down there and their understanding is that all the food there is contaminated. “Where do I buy good food?” I say, hook up with your local farmer, support your local farmer. If you have a young couple in your area that wants to farm, support them as much as you can so they can survive, so they can provide you with food. On Bainbridge Island, it’s very optimistic here, so I want to focus on that, not go global, and just worry about what’s happening in my neighborhood. JG: Tell us where your interest in education and working with young people comes from? BM: I think all of us, at my age, look back at what got us here, why we are here. To me it goes back to camp. I was just talking to an intern today – “you know, I can’t remember what I did today, but I can remember what I did when I was 5 years old.” I was at a Quaker camp back in Pennsylvania, it was way ahead of its time, so pure, and we had a Mr. MacGregor’s garden, if you know that story. We grew a lot of our vegetables and being back in Pennsylvania, a big thing was the rabbits – the cottontail rabbits wanted to go in the garden and eat everything. So I was fascinated at an early age, and I would be hanging out, looking through the fence, and the farmer recognized my interest and said, “I’m going to give you something to do,” and I would catch the rabbits against the fence. That’s what I remember at a really early age, I made that connection. And I ate carrots and the other vegetables and apples – I ate what was available. Times have changed; you know McDonald’s didn’t even happen until the mid 60’s, that was the first fast food. So that all happened, especially when the economy changed and the world got going faster and people needed fast, fast fast. I look back at that time – those early experiences really imprinted on me, my connection, who I am. I’m a different type of person, farmers are different types, certainly independent farmers. We’re free spirits. We have connections, sensitivities that are a lot different. I was drawn to that. I did some teaching – and I remember when I was teaching biology, and a teacher said, “if I can just connect with one kid out of these 30 kids – and see that kid develop a passion.” I feel that way when we take these classes out – if there are a couple kids that take a life experience from that one trip – pulling a carrot out of the ground and just being blown away – and relating where we’re at, the whole existentialist thing – for me – job done. I think you can only teach and be involved in that if you’ve had that experience. Even though they’re not aware of it at the time, it will impact them. I think as a teacher it’s the most satisfying thing. When I’m a farmer in that capacity, I’m a teacher. I’m using the farm and the garden as my classroom. I want to be able to make that connection. JG: You’ve also made a commitment to working with young people through an internship program you’ve had for years. What are you learning about young farmers who come to work for you? BM: Some of these kids who have just finished their undergraduate programs are no different from the preschoolers. They’re out there with all these questions about what they’re going to do in life. And now its even more critical because of their age – the pressure of trying to get their life together – with the pressure of college loans, their parents’ expectations. You go to class – you do the whole thing – but there’s really no one telling you what to do next or how to do it, you have all these things thrown at you through the years. These interns, 22 24, 26, years old – they have no idea what to do next. You’re just taking all this stuff in just like you did in elementary school. The realization that I can impact them as much as I can impact the preschoolers is kind of mindboggling. We’ve had about 30 interns in the past 8 years – individuals who for some reason, wanted that experience of working on an organic farm, either for their resume, or because it’s a cool thing to do, they’re fascinated, or they’re a foodie person. Maybe for some reason in college they were not really focused on that, then they live that 6-month tour of a farm and all the sudden, life has changed. They didn’t know that was available, that you can live that type of lifestyle. Basically what I’ve done all my life – its kind of like Huck Finn with a job, and now I’ve really screwed them up (laughs). And so I feel responsible to stay connected with them, and so many of them are either in food production, got their daddy to buy them a farm, or did an urban farm business or are working at a health food store. It’s really been amazing. The more of us that can raise food, stay connected to mother earth, understand the environment, the better planet we can have. So the more people I can sway that way the better. JG: Why is it important for you to have edible education programs and farm school partnerships on Butler Green Farms? BM: You know, one of the things that is amazing to me – 40 years is a milestone, whether I want to admit it or now. A lot of people retire after 20 years in the business, 25 30 – but I’ve been doing it for 40. And for so long I was alienated because it was not the thing to do, both economically and otherwise. Now in the last 5 to 10 years, there’s been this amazing interest in the community, and I’m looking at it like, squirrels putting nuts away, I’m worrying about holocaust. Why is everyone interested in food preservation, like there’s something coming down the road real soon, and we better get it together, because its all ready to hit. Being a biology and science guy I worry about that kind of thing. But its been amazing – I’m overwhelmed by people and respect those people – whether its someone doing education at a nonprofit – whether it’s a chef that goes out of his way and he knows he’s paying more for food because it’s the right thing to do…to the people who sign up for my CSA – the families who spend more money because its local and they want their kids to eat right and they want to support education – its great. JG: You chose the phrase ‘Growing Healthy Minds’ as the slogan to represent your edible education partnership with EduCulture. Why do those three words have such meaning to you? BM: It was neat putting that together. I’m the one that came up with the mission statement for Friends of the Farms. A mission statement – really you want to have some keys words. With Friends of the Farms it was “promote and enhance farming.” So, growing healthy minds – you want the kids to be involved in growing, and of course healthy is a big thing. You want the kids to learn good eating habits at an early age – eat carrots instead of potato chips. And then the minds – just the idea of thinking about things. JG: As a farmer and a citizen and individual who has dedicated so much to our local community, if you were to look ahead a decade from now, what is your vision for what you would like to see for us as a local farming and food community? BM: There are some obvious things – on Bainbridge Island – you look at saving land, and not paving land, and putting land into food production. One of the goals of farmers is they want to see land be put into production as farmland. Ten years from now I hope we’re on the same path we’re on now, keeping people in the community actively supporting and enjoying their local food production. As we get older, we think about why we have habits. It’s hard to change habits. Farmers grow the same crops, do the same things and we get caught up. If you get into bad habits with food, especially the kids these days with fast food – its not good. We see numbers of life expectancy, juvenile diabetes, cancer rates. Those are the real things and it isn’t until you get to be the age of 50 and are doing your annual physical and start to learn about the state of health and there’s no return and it does have an impact. So much of your life you feel impervious. As adults, to be able to tell our kids, and to be able to tell 20 year olds, as a father, as a parent, you gotta take care of yourself. Both my kids are really food conscious, hopefully their bodies will be free of radicals and carcinogenic things. And you just hope it goes on, at an exponential rate, more mainstream getting involved in good food, and I can just feel good about what I’ve done – somewhere along the line, someone will carry on to do the same thing. That’s all you can do is hope that what you’ve done all your life is carried on, there will be other young farmers to take your place and take it to the next step just like I did when I took over for people like Akio. See more about our partnership with Brian and Morales Farm here.